I love writing for Made For Mums. 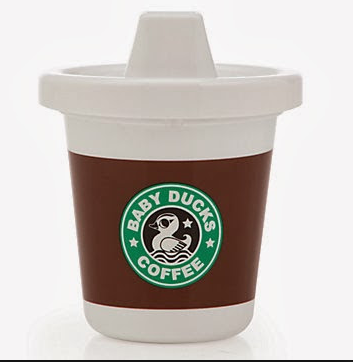 It’s a fab website with tons of information for whatever age your baby is. There is also a fab review section, in which I write for. It’s great because I get to test out the latest baby kit and pass on vital information to other new mums who aren’t as lucky to be able to test things before they buy. 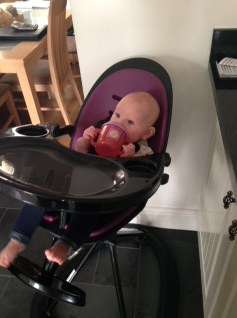 This is my latest review on the Ickle Bubba Orb highchair. You can find the original review here….be sure to check out the rest of the Made For Mums website too. I’ve found it super helpful when it comes to things like weaning and sleep. Enjoy. 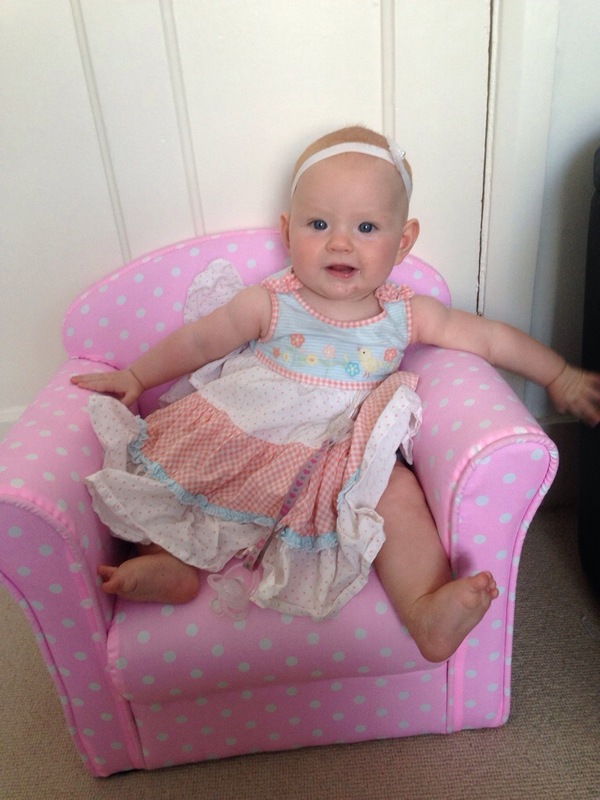 Ickle Bubba, the company behind this chair was set up by husband and wife Fran and Veronica Vaughan in 2011. The company only sells two products; the Stomp v2 travel system and the Orb highchair. The main motivation behind Ickle Bubba was to design a full travel system that looked comparable with the leading brands but at less than half their price. 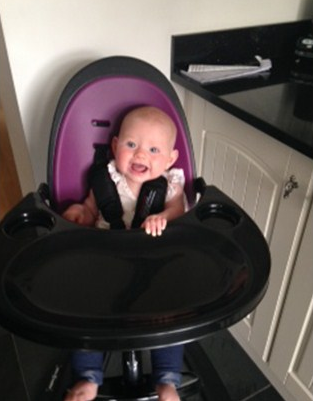 But with the Orb highchair added to its portfolio, which I tested with my six-month old daughter, Lacie, Ickle Bubba have aimed to make a stylish highchair packed with enhanced features. 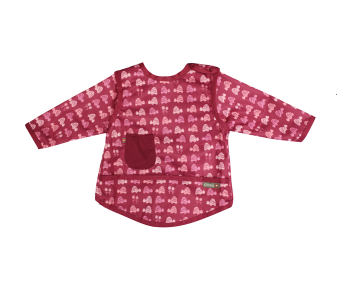 More about quality, not quantity the company has already won a whole plethora of awards, with the Orb featuring in Prima Baby’s six of the best new products for 2014. A futuristic, reclinable, egg-shaped highchair, the Orb is designed to suit newborns and babies from birth to 17 kgs (approx 3 years), making it more of an investment, than an impulse buy. At first glance, it’s clear to see the Orb’s modern style, it would not look out of place in an immaculately decorated show home, where there’s lots of space and most of all not much clutter. It’s something that you would want to blend in with its surroundings and won’t stand out like a sore thumb in your dining room or kitchen. Taking it out of the box, I noticed that the chair was fairly large and bulky, especially the base so I found it really dominated my kitchen. My husband wasn’t happy about that, especially with so many understated highchairs on the market, that would fold up neatly when not being used. I also found it heavy, so once I put it up (which was really simple as it all clipped together) and found a home for it, which is where it stayed. How was assembling the Orb? It was really easy; it comes in three parts, the seat unit (with memory foam insert), the base and removable tray. All in all it took about ten minutes to fit together, to attach the seat pad to the seat you simply chose what height slot you want (there is a choice of two depending on the size of your child) and thread the shoulder straps through the hole. How secure is the Orb chair? The harness itself is easily adjusted with the simple slide of a buckle and there are soft shoulder pads for extra comfort. I did feel that at 15llbs Lacie moved around quite a bit in it and was often lop-sided but she looked comfortable enough and the straps made it very secure, so I wasn’t worried about her slipping out. Yes, the seat insert is padded and so are the shoulder pads, Lacie fell asleep in the chair many times. What do you think about the style of the chair? The Orb is so unusual people will either love it or hate it, it really does depend what type of house you live in – it is certainly different from other highchairs on the market, that can look babyish, plain and plastic. However, the Orb is big, especially the base, and it doesn’t tuck out of the way like other designs on the market. Is it easy to keep the highchair clean? Yes, it is. 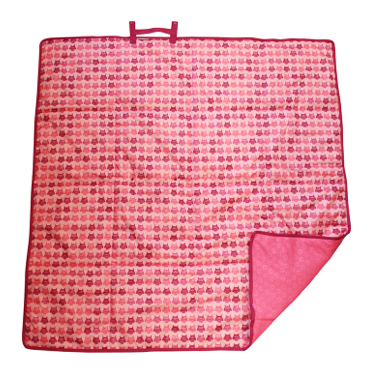 The removable seat pad, which comes in five different colours, is made of a memory foam, rubber type material – which was nice and soft and most importantly easy to take off the seat and wipe down after use or to allow for more seating space for bigger babies. Once I worked out how to remove the tray it was however very easy to clean up any mess. Tell us about the seat’s 360 degree swivel mode. The spinning feature is really cool; with one push of a small button you can turn the seat around in 90-degree turns. It means there are four seating positions available, which is really useful when taking your child out of the highchair or swiveling them round to face Daddy as you go and do the clearing up. It’s great; the height of the chair can be easily adjusted by simply sliding the leg up or down on the triangular frame section. So you can have it at any height you like, depending on whether you’re feeding at a dining table, a breakfast bar or from the sofa. You can also recline the chair. I found this perfect for when Lacie, wanted to snooze or if she needed a change of scenery as we ate our dinner. I did however find the button that did this pretty fiddly; you need to push it in on both sides of the base, which requires two hands and actually felt quite stiff. This left me with no hands to adjust the seat angle or to hold onto my baby as an extra safety precaution. I didn’t want her feeling vulnerable as she tipped back! 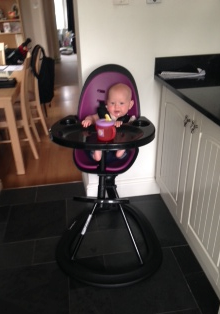 Is the highchair as futuristic as it looks? Yes, there are buttons everywhere; the only problem I have with it is that there is no continuity behind the buttons. Some need pushing, some need to be pulled up and some need to be pulled out. Everything took a few attempts before I worked out what to do, especially with the baby brain still lingering. Is the Orb value for money? Yes, Lacie, got lots of use out of it and so did my nephews. Although this highchair is expensive, it can be used until the age of three and is durable enough to last if we have any more children. You’ll either love the Orb or you’ll hate it, but if your home is super modern or you love design-savvy baby kit, the Orb is definitely for you. Despite its good looks, it also has great practical features like the handy height adjustment and 360-degree rotation. The fact that the tray can be removed so the chair can be pulled up to the table for family mealtimes was a massive positive point for me. We’re well and truly into the weaning – and I’m well and truly back into my old jeans. I’m back to 59’ish Kilos (I’ve never been a big fan of weighing) and in the last six weeks have lost 4.5% body fat. I’ve done this by eating lots of lean protein, green veg, good fats and working out 4-5 times a week. I said it before, and will say it again, it’s all about consistency. If you are eating well and exercising regularly, then you will lose fat. It helps that I’m getting more sleep these days as that stops those awful sugar cravings when you just need an instant hit of energy and I’ve really found that stopping eating in the evenings helps. Nowadays I have my dinner, then usually have a few spoonfuls of almond butter and a herbal tea before shutting the kitchen door and leaving it at that. It’s too easy to say ‘The baby is in bed – this is my time’ and eat food for comfort in front of the TV. The thing is I don’t find it comforting the next day when I’m beating myself up! I’d rather wake up full of energy and without a food hangover so I can get my workout in before Lacie wakes. I tend to do all her bottles and food in the evening too, which keeps me busy and organised for the next day….which leads me on to Lacie’s food. So far, we have only been doing lunch. She has a feed usually around 6am and 9am, and then lunch is served at 12pm. So far her favourite meal has to be banana, avocado and spinach, she can’t get enough! 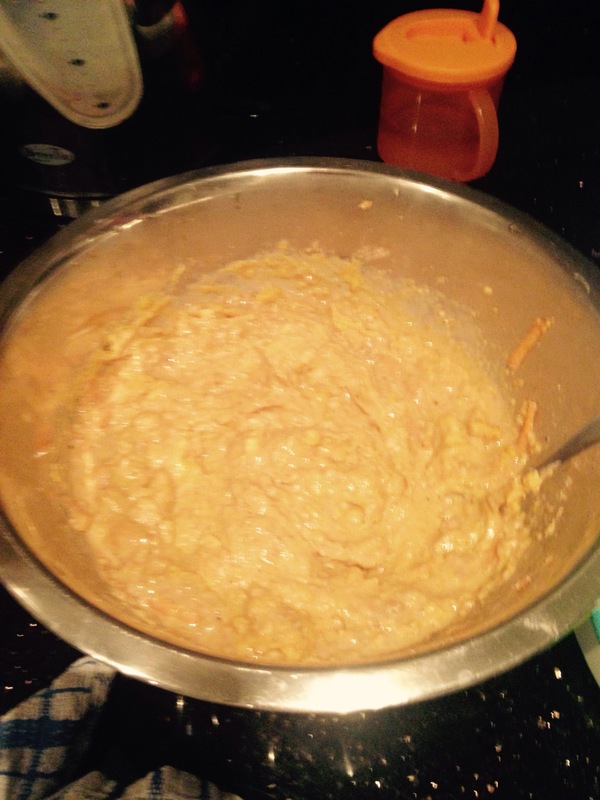 I’ve also tried other concoctions like sweet potato, butternut squash and carrot. 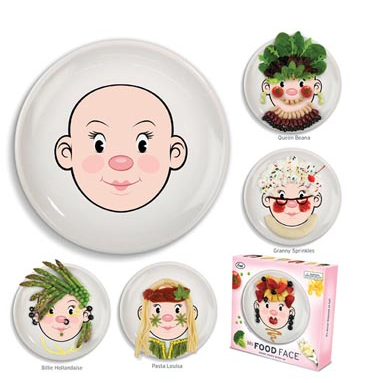 She is also a big fan of pear and apple and tomorrow she has courgette, carrot and apple – just something I threw together. Could be interesting! She’s also a huge fan of a little pudding after lunch (who isn’t?) I tend to blitz some organic berries with CO YO dairy-free coconut yogurt and chia seeds. 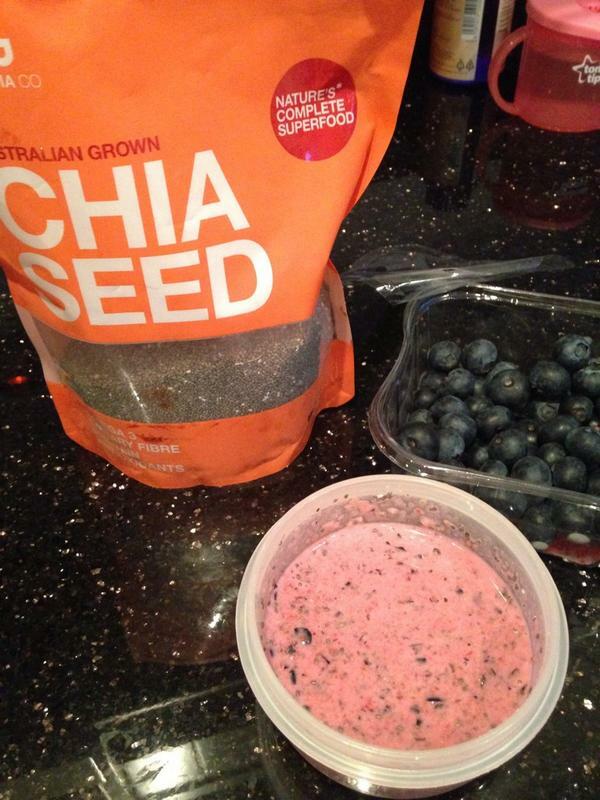 This makes it nice and thick and filling, and I love chia seeds because they are full of omega 3 fats, protein, antioxidants and dietary fibre. 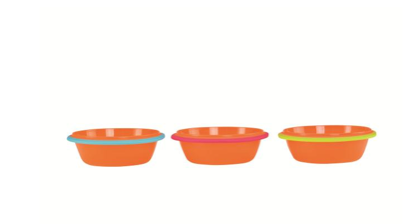 They also hold water so will help keep Lacie’s tummy fuller for longer. She’s definitely a fan…and so am I! She then tends to have a nice sleep (with a full belly), then has a bottle at 2:30ish, another feed at 5:30 and then a bottle before bed at 7:30. She’s certainly sleeping better (touch wood) now she’s on food and filling out a bit and even happier than before. To say I was nervous about weaning is an understatement, but do you know what it’s great fun and I love being creative in the kitchen and giving her the best start I possibly can. I will let you know how breakfast goes next week. I’m thinking colourful smoothie bowls, porridge with mashed banana and cinnamon and overnight oats, fruit and maybe even some scrambled eggs! My baby turned 6 months today. I still can’t believe how much joy she brings into our lives. 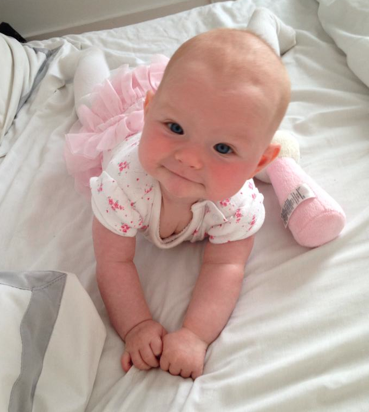 She’s great fun, even on those teething days! Up until now I’ve exclusively breast fed her so weaning feels a bit alien to me. I was very overwhelmed by it all, but actually they say ‘food before one is fun’, so I’ve relaxed a little and am just going to experiment with her and give her the purest foods I can. ‘Healthy Mummy, Healthy Baby’ and all that! 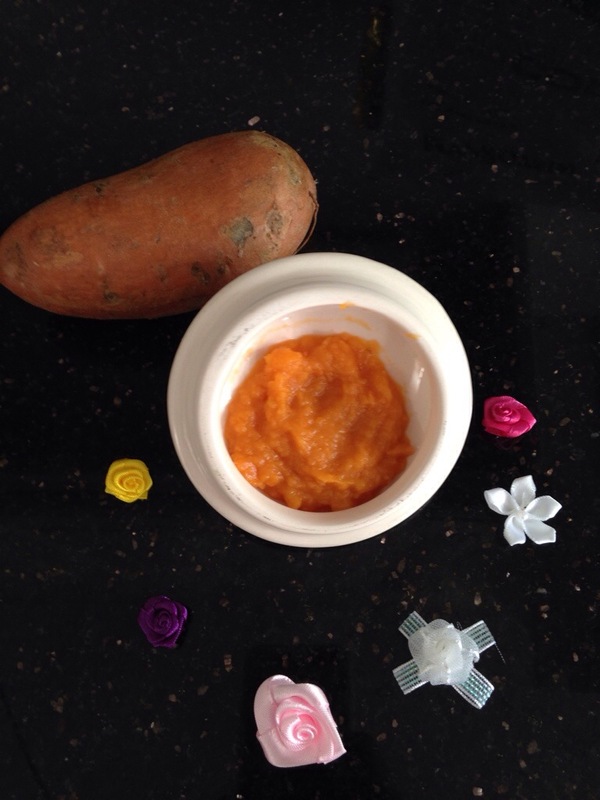 So today I started my little munchkin off with some sweet potato, which is full of vitamin A, C and potassium. She wasn’t impressed to start with but I’m definitely going to keep trying and stick to that particular food for three to your days so her taste buds can adapt. As it’s six months since I had her I thought it would be rude not to post a progress photo. I’m getting regular workouts in these days, even if it means waking up a little early or having her in the gym with me. It’s definitely all about consistency so if you aren’t seeing results as quick as you would like then don’t give up. It will come! As always give me a shout if you have any questions…. I haven’t given you an insight into my day for a while now so thought I would share my day today. It’s been a fun one, full of smiles, training, good food and of course quality time with my little angel! To start my day off I had scrambled eggs with broccoli and a sprinkle of goats cheese. I’ve really taken charge of my eating lately as I’ll be weaning Lacie in a few weeks time and won’t have the whole breast feeding excuse to eat what I like anymore. I thought if I rein it in now then it won’t be so much of a shock to the system. 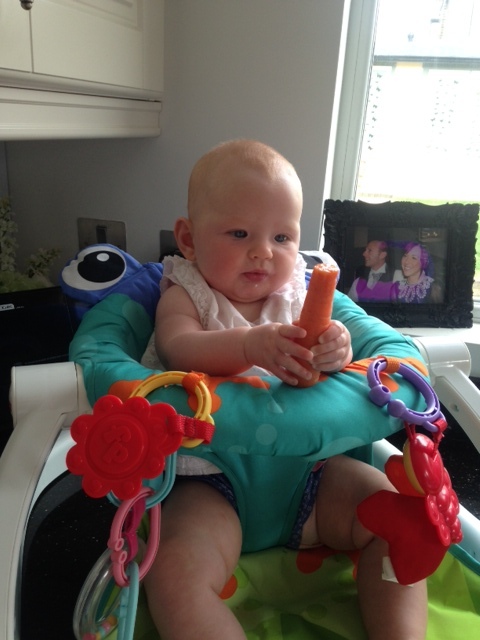 I don’t like change…and I’ll be honest the whole weaning process is scaring me slightly! 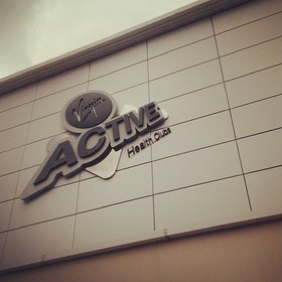 I then ventured to my local Virgin Active – my second home! Today I played around with this interesting looking ball – also known as a Weightedi Ball, a functional piece of kit that’s a but like a medicine ball but squishy! You can kneel on it to do core moves like bird dogs or put your feet on it and use as a platform for things like glute bridges and lunges. 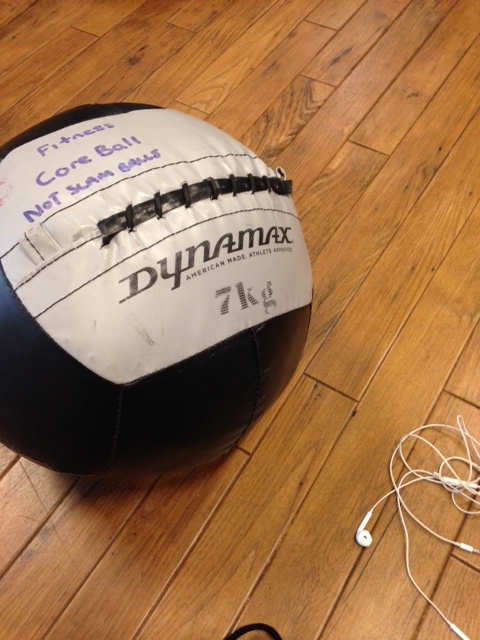 I used it for a which warm up to help me engage my core and switch on my glutes and away I went. 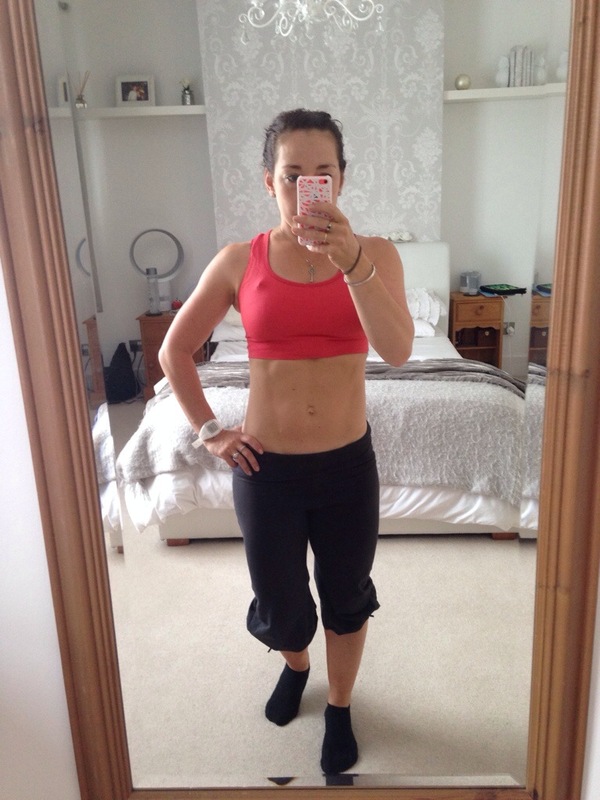 I love my local Virgin Active – I only go once a week (twice as I take Lacie swimming on Tuesdays) as all the other times I use the great outdoors and my home gym in my garden whilst Lacie is sleeping or in the pram, so when I do go, I really go to town. After my warm up I did a metabolic circuit compromising of a push exercise, followed by a pull exercise, a lower body exercise, plyometric jumping move and then finished off with a isometric exercise to really burn my muscles out. I repeated this circuit three times and Jeez I’m aching already! Yay! Feel the burn! They have a great selection of kit in the gym, so I found myself a spot and kitted myself out with a barbell, plyometric platform and a TRX. The hour flew by! When I go home, I fed Lacie and then made myself a chicken salad followed by some sparkling water with lemon, which helps to take the edge of my after meal cravings.. In the afternoon as Lacie cat napped I then caught up on a few emails and features before taking her to a school that I teach gymnastics at to meet all the children. Needless to say, they loved her and she enjoyed the attention. 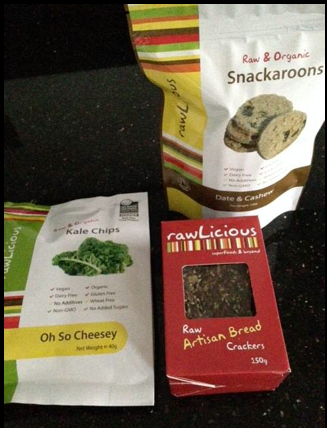 I then came home and had a few of my favourite RawLicious Raw Artisian Bread Crackers spread with Organic Butter to take the edge of my hunger whilst Lacie played in her favourite Fisher Price Sit Me Up Floor Seat and attempted to eat a carrot. I’m trying to give her things to experiment with at the moment so when it comes to weaning putting food in her mouth isn’t totally alien. She definitely seemed to like it! For dinner I had a salmon fillet (lots of good fats!) with broccoli, carrots, sweetcorn and green beans. I love filling up on vegetables at dinner time. I then had a few RawLicious Date & Cashew Snackaroons, which by the way are sooooooo delicious and free from wheat, gluten, sugar, refined salt or anything artificial. You must give them a try they are made from coconuts, dates, nuts, raisins, ginger and vanilla powder. No nasties in sight!